There were two stand-out, runaway favorites in the New Hampshire primary results: Ned Augenblick and Scott Nicholson. Their names weren't on the ballot per se, but their theory on ballot position and choice fatigue certainly was. 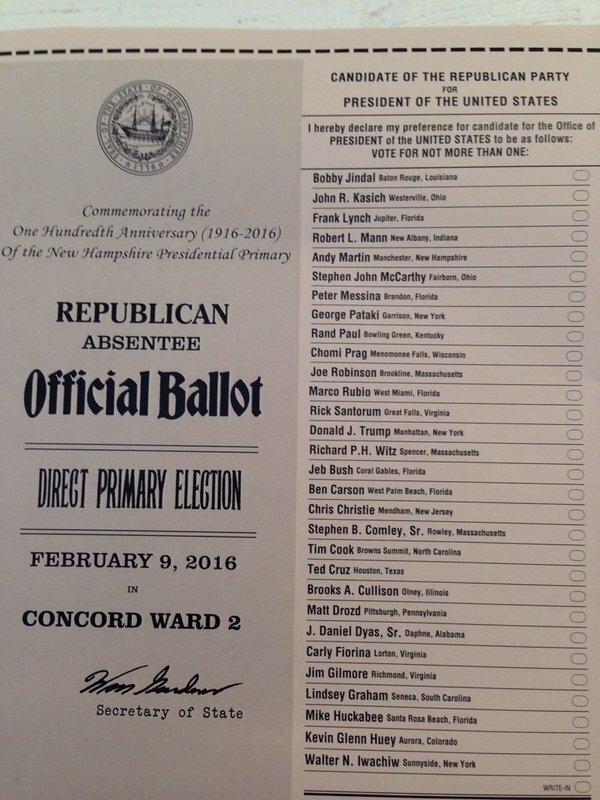 John Kasich was the only major candidate in the top half of the New Hampshire republican presidential primary ballot. Augenblick and Nicholson found that voters would be more likely to vote for things that appear earlier in the ballot, and this result was very much confirmed in New Hampshire where the official list of republican presidential candidates was much longer than the national list. Kasich was the only nationally known candidate still in the race to appear in the top half of the list, and as the decision-fatigue theory predicted, he massively outperformed the polls and came in second over all. Of course, Trump and Sanders also won their primaries, for whatever that's worth. Clinton and Rubio were the biggest losers. Rubio was expected to surge into second place after his better-than-expected Iowa performance. New Hampshire at best interrupts his momentum, at worst confirms that Christie's attack in the last debate--probably the single most effective attack against a major candidate ever launched--was as destructive for Rubio as everyone thought. As for Clinton, for someone who not long ago was supposed to win all the primaries without much trouble, the tie in Iowa and loss in New Hampshire represents a pretty serious upset.